Offended by breast pumps in the workplace? Get over it. The New York Times blog, Motherlode, featured a post yesterday about a nursing mother whose (female) co-worker was offended by her breast pump bag sitting out in their shared office space. With the current backlash on nursing in public, I suppose I should not be surprised by this either. I briefly commented on the blog, but wanted to talk about this issue in more depth here. As I mentioned in my comments, I was very fortunate that when I had my daughter the company I worked for at the time made reasonable accommodations to support breastfeeding mothers. They provided a 50% co-pay towards the purchase of a good quality breast pump, which was designed to support and encourage mothers returning to work. They had dedicated lactation rooms in their offices and the rooms featured a lockable door, sink, small fridge for storing breast milk, comfortable chair, telephone, and T1/LAN lines for computer use. Granted, they were a global professional services firm and had the means to provide these accommodations, but their support made it much easier for me to transition back to work after several months of maternity leave. It’s frustrating to me when I hear of women being denied time or space to pump during the workday. Yet, no one blinks an eye when someone leaves for a 10 minute smoke break! Support for breastfeeding mothers is a human resources issue. Efforts should be made to educate employees about the value of supporting working (and breastfeeding) mothers, and eliminate discrimination in the workplace. It’s hard enough to return to work, leave your child in the care of someone else, and fit pumping into a busy schedule without being scrutinized or harassed by colleagues. It also costs HR departments more in terms of time and money to find, hire and train a new hire to replace a breastfeeding mother than it does to make it possible for her to pump at work. And many women do not breastfeed their children beyond 6 months to a year, so the investment in her needs will outweigh finding a replacement if she decides to stay home due to lack of support. Reasonable accommodations should be made to ensure a comfortable, private place for women to pump, clean pump parts, and safely store breast milk. The size of the office may not be able to offer a room quite as nice as the one I had access to but it should not be a bathroom (uncomfortable and unsanitary.) Nor should it be some other place where a woman might be concerned that someone will walk in on her or need the room during a pumping session. Pumping is a lot of work and often stressful for mothers. If they have to be concerned about not being able to use a room, or being interrupted during a pumping session, it will affect the amount she can express at one time. The less breast milk she can express, the less there is available to feed her baby. Do you really want to place that burden of worry on a mother? I understand that some people are squeamish about the idea of bodily fluids, but breast milk is not an excretory product. It’s not waste, it’s food. 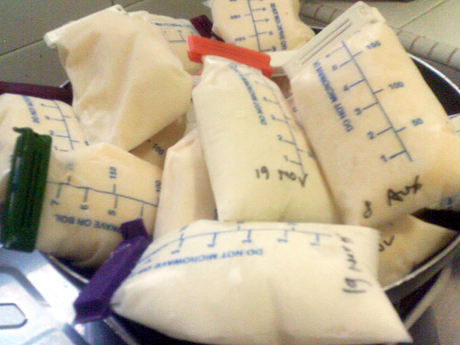 Breast milk is vital infant nutrition. No one squirms over a gallon of cow’s milk, which is expressed from bovine teats in relatively similar fashion, so why get all bent out of shape about breast milk? And in terms of overall nutritive value for humans, breast milk is hands-down a better choice than cow’s milk. Does anyone remember the amazing story of Kati Kim, who was lost in the Oregon wilderness with her family and kept her children alive by breastfeeding them? Breast milk nurtures and sustains human life. Breastfeeding helps mothers’ bodies to heal from birth and the uterus to return to a normal, pre-pregnancy size. It helps protects women against breast cancer. Babies who are breastfed tend to be of a healthier weight and may experience fewer ear infections, colds or other common illnesses than formula-fed babies. When you consider these facts, it makes sense for companies to support breastfeeding mothers by supporting their right to pump at work because the healthier mother and her baby are, the less time a breastfeeding mother needs to take off from work. Most working mothers who pump take great pains to be discreet with the use, cleaning and storage of their breast pump and milk. Almost no one wants to be caught washing out flanges when their boss walks into the break room sink (unless if their boss is a woman who also pumped at work.) At first glance, many people do not know what those black bags or backpacks even hold. The manufacturers purposely made them to blend in with work bags and attire. I think it’s ridiculous that anyone should be asked to hide their breast pump bag (which is so innocuous-looking to begin with) in case it might offend someone. So, what’s really the issue here? That your co-worker is using those breasts for anything other than filling out her blouse? That she might be taking too many “breaks”? (As if pumping was a fun activity.) That womens’ bodies are designed to create, grow, give birth to, and sustain life without help from the stork or a formula bottle? It’s time for us to evolve and embrace what is natural and normal as a species. Breastfeeding mothers have had to adapt to the limitations of the workplace by pumping on a schedule rather than nursing on demand; the least we should do is support them in the process. Tags: babies, backlash, breast pumps. office, breastfeeding, human resources issues, lactation, workplace. Bookmark the permalink.